Harvard University, 2014, Stegmaier K, et al. Shown are WT pan T cells (both CD4＋and CD8＋ T cells; CD4－T cells are CD8＋T cells) after drug treatment. Blood 2012 120(19), 4093-103. Momelotinib (CYT387) purchased from Selleck. 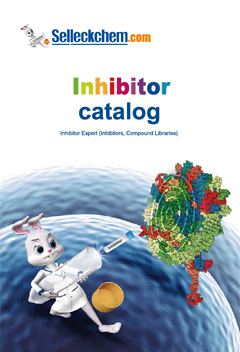 IL-6- supported INA-6 cells were treated with the JAK inhibitors ruxolitinib (Rux; 10 nM) or CYT387 (CYT; 50 nM) for 1 hour and assessed for inhibition of STAT3 phosphorylation by immunoblotting. J Clin Invest 2014 10.1172/JCI69094. Momelotinib (CYT387) purchased from Selleck. Leukemia, 2018, doi:10.1038/s41375-018-0169-y. Momelotinib (CYT387) purchased from Selleck. 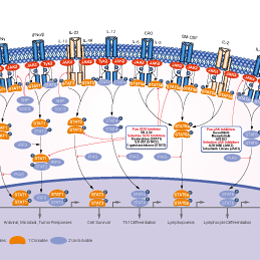 HEL cells, expressing the Jak2-V617F mutant and showing constitutive activation of STAT5, were treated for 3h with Cyt387 at the indicated concentrations. Cells lysates were then subjected to SDS-PAGE and Western blotting. The Blots were detected with the indicated fluorescent antibodies using the LI-COR Biosciences detection system. 2014 Dr. Claude Haan and Catherine Rolvering from University of Luxembourg. Momelotinib (CYT387) purchased from Selleck. Glutathione-S-transferase (GST)-tagged JAK kinase domains expressed in insect cells are purified before use in a peptide substrate phosphorylation assay. Assays are carried out in 384-well optiplates using an Alphascreen Protein Tyrosine Kinase P100 detection kit and a PerkinElmer Fusion Alpha instrument. Animal Models: Balb/c mice are transplanted with bone marrow transduced with a JAK2V617F retrovirus. Pardanani A, et al. Leukemia, 2009, 23(8), 1441-1445. Monaghan KA, et al. Leukemia, 2011, 25(12), 1891-1899. Tyner JW, et al. Blood, 2010, 115(25), 5232-5240.